Since the beginning of time, all living creatures have been, and are still being, exposed to radiation. Nonetheless, most people are not aware of all the natural and man-made sources of radiation in our environment. 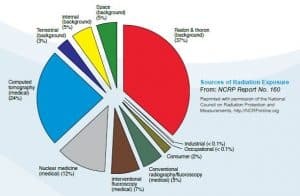 Natural sources of radiation account for about 50 percent of human exposure, while man-made sources account for the remaining 50 percent. This article discusses various sources of radiation we find both man made and natural. A worker holding a plutonium button. Plutonium, a man-made substance, was rare. Scraps resulting from production and plutonium recovered from retired nuclear weapons were reprocessed into valuable pure-plutonium metal. Radiation is all around us, and there are different radiation sources. It can occur naturally, and it is present ever since the formation of the earth. It is also emitted by the sun and present in the sky and soil. In addition, as technology advanced, some artificial or man-made sources of radiation were also discovered. Typically, a person is four to five times more exposed to radiation that occurs naturally as compared to radiation that is artificial. The NRC website has an interactive personal annual radiation dose calculator to estimate your personal dose. Terrestrial radiation is the portion of the natural background radiation that is emitted by naturally occurring radioactive materials, such as uranium, thorium, and radon in the earth. The major materials of concern for terrestrial radiation are common elements with low-abundance radioactive isotopes, like potassium and carbon, or the long-lived elements uranium and thorium and their decay products, some of which, like radium and radon are intensely radioactive but occur in low concentrations. Most of these sources have been decreasing, due to radioactive decay since the formation of the Earth, because there is no significant amount currently transported to the Earth. This means that the present activity of the isotope uranium-238 is only half of its original amount due to its 4.5 billion year half-life. However, the effect of this decrease to humans is minimal. This is for the reason that human history is so short as compared to a half-life of a billion years. Cosmic radiation is a source of natural background radiation, which originates in outer space and is composed of penetrating ionizing radiation (both particulate and electromagnetic). Cosmic rays are very high-energy particles, mainly originating outside the Solar System. They may produce showers of secondary particles (particle showers) that penetrate and impact the Earth’s atmosphere and sometimes even reach the surface. The sun and stars send a constant stream of cosmic radiation to Earth, much like a steady drizzle of rain. Differences in elevation, atmospheric conditions, and the Earth’s magnetic field can change the amount (or dose) of cosmic radiation that we receive. At commercial aircraft altitudes cosmic radiation is much more intense than on the ground. Even though exposure can be a hundred times greater at these altitudes than it is on the ground, it is still fairly small. It would take about 100 one-way flights between Toronto and Vancouver to obtain the same exposure as we get in one year from other sources of natural background radiation. Lithium, beryllium, and boron are relatively abundant in the universe, and particle showers contain increased amounts of these elements. Cosmogenic stable isotopes and radioisotopes like carbon-14 are also produced by cosmic rays. HZE ions are the high-energy nuclei component of galactic cosmic rays (GCRs) which have an electric charge greater than +2. HZE ions include the nuclei of all elements heavier than hydrogen (which has a +1 charge) and helium (which has a +2 charge). Each HZE ion consists of a nucleus with no orbiting electrons, meaning that the charge on the ion is the same as the atomic number of the nucleus. A solar proton event (or proton storm) occurs when protons emitted by the Sun become accelerated to very high energies either close to the Sun during a solar flare or in interplanetary space by the shocks associated with coronal mass ejections. Besides protons, the events can include other nuclei like helium ions and HZE ions, meaning that the event is sometimes a solar particle event. There is no substantive scientific evidence to suggest that energetic proton events are harmful to human health at ground levels, particularly at latitudes where most of the Earth’s population resides. The Earth’s magnetic field is exceptionally good at preventing the radioactive effects of energetic particles from reaching ground levels. High altitude commercial transpolar aircraft flights have measured increases in radiation during energetic proton events, but a warning system is in place that limits these effects by alerting pilots to lower their cruising altitudes. Aircraft flights away from the polar regions are far less likely to see an impact from solar proton events. Significant proton radiation exposure can be experienced by astronauts who are outside of the protective shield of the Earth’s magnetosphere, such as an astronaut in-transit to, or located on the Moon. However, the effects can be minimized if astronauts are in a low Earth orbit and remain confined to the most heavily shielded regions of their spacecraft. Proton radiation levels in low Earth orbit increase with orbital inclination. Therefore, the closer a spacecraft approaches the polar regions, the greater the exposure to energetic proton radiation will be. Actinides are naturally occurring metals that are radioactive, examples are uranium and plutonium. On the periodic table of elements, the actinides are the 15 metallic chemical elements with atomic numbers from 89 to 103, actinium to lawrencium. All actinides are radioactive and release energy upon radioactive decay. Thorium and uranium are the two most common radioactive elements on Earth; they have been around since the Earth was formed. Uranium, thorium, and plutonium, the most abundant actinides on Earth, are used in nuclear reactors and nuclear weapons. The other Actinides are synthesized. Actinides are typical metals. All of them are soft and have a silvery color (but tarnish in air), relatively high density and plasticity. Some of them can be cut with a knife. The actinides form a family of elements with the same properties. There are two overlapping groups within the actinides: (1) transuranium elements which follow uranium in the periodic table; and (2) transplutonium elements which follow plutonium. Actinides have some well-known daily-life applications. For instance, they are useable in smoke detectors and gas mantles. More so, they can also be utilized as fuel in nuclear reactors and in nuclear weapons. Periodic Table showing Actinides in the bottom row which include thorium and uranium, the two most common radioactive elements on earth. For nuclear power, uranium-235 is considered as the most important isotope as it is used in the thermal reactor. Thorium-232 and uranium-233 are other promising actinide isotopes that may be used for nuclear power. Plutonium-238, is a radioactive isotope of plutonium with a half-life of 87.7 years. Because it is a very powerful alpha emitter that does not emit significant amounts of other, more penetrating and thus more problematic radiation, this isotope is used for radioisotope thermoelectric generators and radioisotope heater units. Plutonium is an actinide mostly applied in nuclear weapons and nuclear reactors. Some space satellites and stations used Plutonium-238 in their thermopiles and water distillation systems. It is also important to note that it has properties that make it ideal to be used as an energy source for heart pace-makers as they last about 5 times longer than conventional batteries. On September 11, 1957, at the Rocky Flats Plant, a nuclear weapons production facility near Denver, Colorado, a plutonium fire occurred in one of the gloveboxes used to handle radioactive materials, igniting the combustible rubber gloves and plexiglass windows of the box. Metallic plutonium is a fire hazard and pyrophoric; under the right conditions it may ignite in air at room temperature. The accident resulted in the contamination of Building 771 and the release of plutonium into the atmosphere. 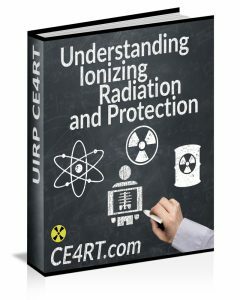 Radon is responsible for the majority of the public exposure to naturally occurring ionizing radiation. It is often the single largest contributor to an individual’s background radiation dose. The amount is variable from location to location. Radon gas from natural sources can accumulate in buildings, especially in confined areas such as attics, and basements. It can also be found in some spring waters and hot springs. Epidemiological evidence shows a clear link between breathing high concentrations of radon and incidence of lung cancer. Thus, radon is considered a significant contaminant that affects indoor air quality worldwide. According to the United States Environmental Protection Agency, radon is the second most frequent cause of lung cancer, after cigarette smoking in the United States. Radon is a chemical element with symbol Rn and atomic number 86. It is a radioactive, colorless, odorless, tasteless, noble gas, occurring naturally as an indirect decay product of uranium or thorium. Radon is a radioactive gas that cannot be perceived by sight, smell, or taste. It occurs naturally as the decay product of either uranium or thorium. It is a one of the densest substances, and under normal conditions, remains as a gas. Due to radon’s radioactivity, it is considered a health hazard. With its intense radioactivity, chemical studies for radon are hard to conduct. For this reason, only a few compounds are known. Illustration of a Radon Atom. Radon is one of the densest substances that remains a gas under normal conditions. and is a major contributor to background radiation. High levels of radon accumulation in houses were discovered accidentally in 1984. This happened when an engineer at a nuclear power plant underwent strict radiation testing and it was found out that he was contaminated by radioactive substances from his home. Since that time it was discovered that radon from soil gas is the main cause of radon problems. Sometimes radon enters the home through well water. In a small number of homes, the building materials can give off radon, too. However, building materials rarely cause radon problems by themselves. Testing for radon is available and recommended by the EPA. Short-term testing takes anywhere from a few days to several months to complete. The most common testing devices on the market right now are charcoal canisters, electret ion detectors and alpha track detectors. Short-term testing should be conducted in the lowest living area of your home, with the doors and windows shut, during the cooler months of the year. Long-term Testing Is The Most Accurate Way To Test For Radon. Long-term testing can take up to a full year. Alpha track detectors and electret ion detectors are the most common long term testing devices. Be sure to look for a test kit from a company that is “qualified” (see www.epa.gov/radon/radontest.html for more information on how to find a “qualified” radon service professional). Some State Radon offices also have a list of all radon measurement companies that meet their state requirements. Nearly 1 out of every 15 homes in the U.S. is estimated to have elevated radon levels. Step 1. Take a short-term test. If your result is 4 pCi/L or higher take a follow-up test to be sure. 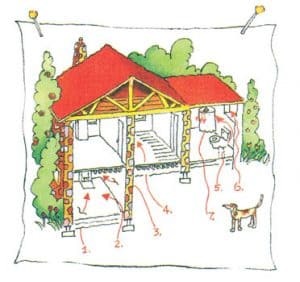 Diagram showing areas of entry for radon in a typical home. Bananas are known to contain radioactive isotopes of potassium. Nearly all foods are slightly radioactive naturally without any exposure to manmade sources. Bananas are particularly so, due to the radioactive potassium-40 (40K) they contain. All food sources combined expose a person to around 40 millirems per year on average, or more than 10% of the total dose from all natural and man-made sources. There is an indicator called banana equivalent dose which is approximately the radiation exposure received by eating a single banana. Radiation leaks from nuclear plants are often measured in extraordinarily small units (the picocurie, a millionth of a millionth of a curie, is typical). By comparing the exposure from these events to a banana equivalent dose, a more intuitive assessment of the actual risk can sometimes be obtained. The equivalent dose for 365 bananas (one per day for a year) is 3.6 millirems (36 μSv). Besides bananas, other foods that are rich in potassium (and therefore in 40K) are potatoes, kidney beans, sunflower seeds, and nuts. Brazil nuts are rich in 40K but also radium may have up to 444 Bq/kg (12 nCi/kg) – five times the radioactivity of bananas. But don’t race to the kitchen to throw out your bananas. Experts, including the EPA, point out that the amount of potassium (and therefore of 40K) in the human body is fairly constant because of homeostasis, so that any excess absorbed from food is quickly compensated by the elimination of an equal amount. Nuclear fallout, or simply fallout, also known as Black Rain, is the residual radioactive material propelled into the upper atmosphere following a nuclear blast or a nuclear reaction conducted in an unshielded facility, so called because it “falls out” of the sky after the explosion and shock wave have passed. It commonly refers to the radioactive dust and ash created when a nuclear weapon explodes, but such dust can also originate from a damaged nuclear plant. This radioactive dust, consisting of material either directly vaporized by a nuclear blast or charged by exposure, is a highly dangerous kind of radioactive contamination. 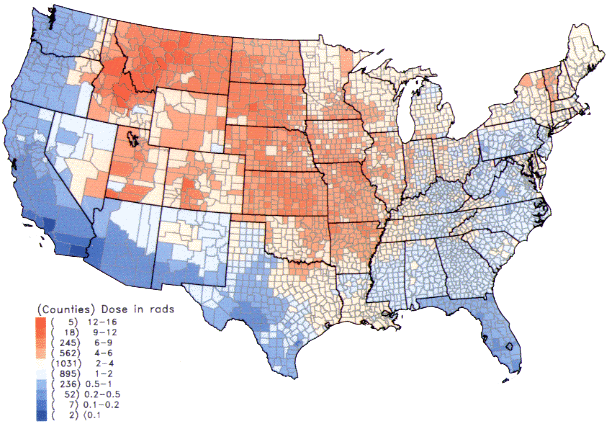 Per capita thyroid doses in the continental United States of Iodine-131 resulting from all exposure routes from all atmospheric nuclear tests conducted at the Nevada Test Site. After an air burst, fission products, un-fissioned nuclear material, and weapon residues vaporized by the heat of the fireball condense into a fine suspension of small particles 10 nm to 20 μm in diameter. These particles may be quickly drawn up into the stratosphere, particularly if the explosive yield exceeds 10 kt. The radio-biological hazard of worldwide fallout is essentially a long-term one because of the potential accumulation of long-lived radioisotopes (such as strontium-90 and caesium-137) in the body as a result of ingestion of foods containing the radioactive materials. This hazard is less pertinent than local fallout, which is of much greater immediate operational concern. In a land or water surface burst, heat vaporizes large amounts of earth or water, which is drawn up into the radioactive cloud. This material becomes radioactive when it condenses with fission products and other radiocontaminants that have become neutron-activated. Some radiation would taint large amounts of land and drinking water causing formal mutations throughout animal and human life. Severe local fallout contamination can extend far beyond the blast and thermal effects, particularly in the case of high yield surface detonations. The ground track of fallout from an explosion depends on the weather from the time of detonation onwards. In stronger winds, fallout travels faster but takes the same time to descend, so although it covers a larger path, it is more spread out or diluted. So the width of the fallout pattern for any given dose rate is reduced where the downwind distance is increased by higher winds. The total amount of activity deposited up to any given time is the same irrespective of the wind pattern, so overall casualty figures from fallout are generally independent of winds. But thunderstorms can bring down activity as rain more rapidly than dry fallout, particularly if the mushroom cloud is low enough to be below (“washout”), or mixed with (“rainout”), the thunderstorm. According to a 1992 report from the National Cancer Institute, about 150 million curies of radioactive iodine was released in open air from nuclear testing in Nevada during the time of open air nuclear testing from the early 1950’s to the early 1960’s. One effect of this was that it was causing heavy contamination of the nation’s milk supplies. Cows that eat the grass in areas affected by fallout will pass those contaminants along into the milk, especially Iodine 131. Today, pasteurized milk samples are collected at dairy plants regularly and tested for radioactivity. Internal exposure to radioactive iodine-131 through ingestion. Some of the essential elements that make up the human body, mainly potassium and carbon, have radioactive isotopes that add to our background radiation dose. So all people have internal radiation, mainly from radioactive potassium-40 and carbon-14 inside their bodies since before birth and, therefore, are sources of exposure to others. The variation in dose from one person to another is not as great as that associated with cosmic and terrestrial sources. Vitruvian Man by Leonardo Da Vinci. Even all human bodies normally contain some traces of radioactive isotopes. Depleted uranium is uranium with a lower content of the fissile isotope U-235 than natural uranium. Uses of DU take advantage of its very high density of 19.1 g/cm3 (68.4% denser than lead). Civilian uses include counterweights in aircraft, radiation shielding in medical radiation therapy and industrial radiography equipment and containers used to transport radioactive materials. Military uses include defensive armor plating and armor-piercing projectiles. Most depleted uranium arises as a byproduct of the production of enriched uranium for use in nuclear reactors and in the manufacture of nuclear weapons. The use of DU in munitions is controversial because of questions about potential long-term health effects. Normal functioning of the kidney, brain, liver, heart, and numerous other systems can be affected by uranium exposure, because uranium is a toxic metal. It is only weakly radioactive because of its long radioactive half-life (4.468 billion years for uranium-238, 700 million years for uranium-235). The biological half-life (the average time it takes for the human body to eliminate half the amount in the body) for uranium is about 15 days. The primary radiation danger from depleted uranium is due to alpha particles, which do not travel far through air, and do not penetrate clothing. Thus, the primary concern is internal exposure, due to inhalation, ingestion or shrapnel contamination. Available evidence suggests that this risk is small relative to the chemical hazard. Gunner’s mates inspect linked belts of Mark 149 Mod 2 20mm ammunition before loading it into the magazine of a Mark 16 Phalanx close-in weapons system aboard the battleship USS MISSOURI. Although the most significant man-made source of radiation to the public is from medical procedures. Some consumer products also contain small amounts of radioactive material such as building and road construction materials, combustible fuels including gas and coal, x-ray security systems, televisions, fluorescent lamp starters, smoke detectors (americium), luminous watches, tobacco smoke, and some ceramics. “Smoking Club” – An illustration included in Frederick William Fairholt’s Tobacco, its history and associations. Tobacco smoke is known to contain radioactive elements. Cobalt is an element of steel alloys. Cobalt-60 (60Co )is a radioactive isotope of cobalt used for sterilization and other industrial applications. Uncontrolled disposal of 60Co in scrap metal is responsible for the radioactivity found in several iron-based products. The vast majority of man made radiation exposure to the population is from medical procedures. The table below shows a comparison of various types of manmade radiation exposure and radiation based medical procedures a person can be subjected to. 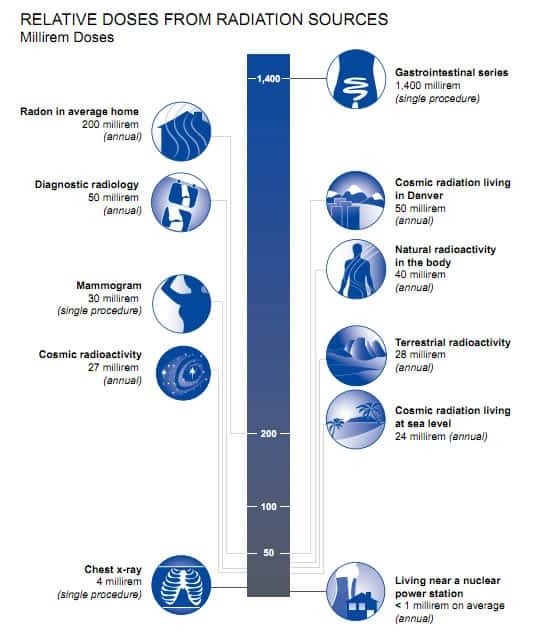 It lists them in order of level of exposure measured in Sv and shows in another column approximately how long it would take for someone to receive the same dose of radiation from the natural environment. 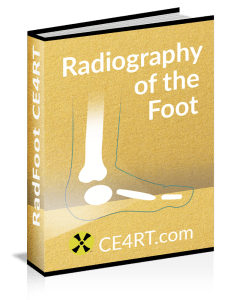 The goal of this is to attempt to gather some perspective on these procedures from the standpoint of a patient receiving radiation and being concerned about the risk. Dose is based on a normal effective dose for that type of scan. Actual doses used for a specified scan vary widely depending on the medical institution, the individual, and other factors. In later chapters we discuss methods to minimize this exposure. As medical professionals we have an obligation to keep these levels to a minimum.